← Get your library card! When Mr. Kleon was asked to address college students in upstate New York, he shaped his speech around the ten things he wished someone had told him when he was starting out. 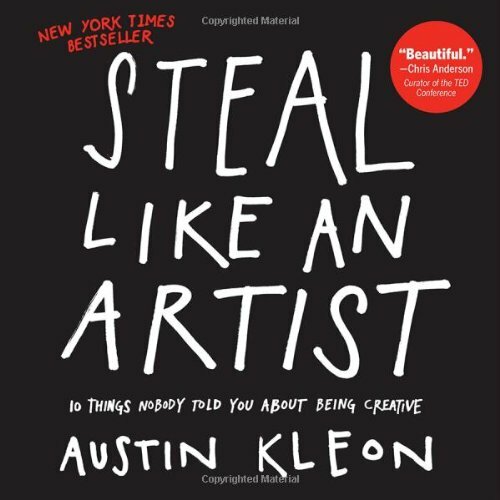 The talk went viral, and its author dug deeper into his own ideas to create Steal Like an Artist, the book. The result is inspiring, hip, original, practical, and entertaining, and filled with new truths about creativity. His insights include: Nothing is original, so embrace influence, collect ideas, and remix and re-imagine to discover your own path. Follow your interests wherever they take you. Stay smart, stay out of debt, and risk being boring—the creative you will need to make room to be wild and daring in your imagination. (Summary from Amazon). I came to this book from a writer’s perspective rather than a visual art perspective. But no matter what medium you choose, I think this book can be helpful to all artists. Because ultimately, making good art is recycling all the old ideas that humanity has had and trying to make new connections and find new interesting intersections, as well as taking an old idea and adding your voice to it. My favorite page of the whole book is a graph of the life cycle of a creative project. You can see it online at Austin Kleon’s tumblr here. I love it because it normalizes the process, in my opinion. Looking at the graph again, I think I am stuck at point number two right now in my current writing project – Ok, this is going to be harder than I thought. But that is ok. I have a sticky note on that particular page in my copy at home because it rings so true to me. It is not only that single page that has stuck with me, but also that Kleon writes about both the work and play of creativity in a way that really speaks to me as an artist. I completely recommend this for anyone who pursues creative outlets whether as a hobby or a profession. Enjoy! This entry was posted in Information and tagged book review, ecc library, Special Information, Special Interest. Bookmark the permalink.